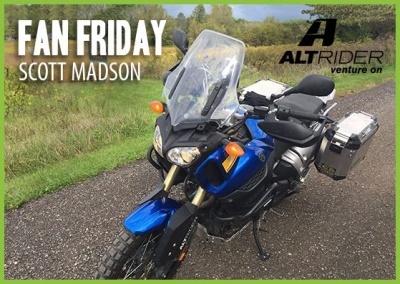 "I first learned about AltRider after seeing their crash bars installed on my friend Harry's '14 Yamaha Super Tenere. I really liked the shape, construction and simple installation of the bars. There was no doubt I would get your bars for my '12 Yamaha Super Tenere which I purchased last year. The crash bars were the very first farkles I installed. This past spring, while planning a ride to Glacier and the Lolo Motorway in Idaho, I knew I needed more protection for the bike. I then installed your fork guards which again have proven easy to install and are quite durable. This past July, Harry and I took out Tenere's on a 10 day trip through Glacier, Lolo Pass and the open ranch land of Wyoming. Bars and fork guards did their job as I did drop the "big girl" a few times -- and bars were no worse for wear. Even though they are not the cheapest, I do believe they are the best value as I am confident your parts will hold up to the wear and tear of dual sport riding. All while still looking great."